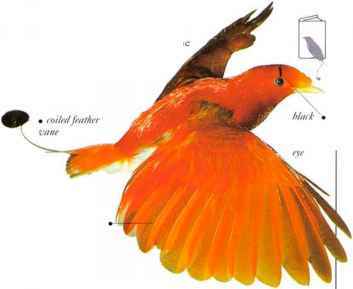 ' I hough vividly colored, the male of this species is inconspicuous for much of the time, hiding in lowland rain forest. When activ e, hops through the branches in search of insects, berries, and other small fruits. To court females, lie selects a suitable tree for his display, puffs out his plumage, raises his tail plumes, and utters repeated screams. After mating, females nest alone. • Nest a thick cup nest of palm fibers, in a tree hole. I -owland areas of ^ New Guinea. • remark The male's tail accounts for the length difference between sexes.